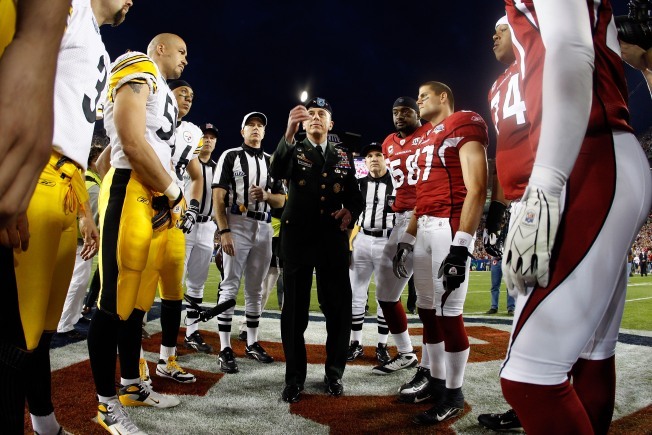 General David H. Petraeus performs the coin toss before Super Bowl XLIII between the Arizona Cardinals and the Pittsburgh Steelers.As game began, election results underscored success of Petraeus' surge strategy. It was Super Sunday -- but not just because it was the NFL's annual Big Game. Who was right there in Tampa, Florida to help start America's unofficial National Holiday? One Gen. David H. Petraeuswho launched the game by performing the official coin toss. Meanwhile, a half-world away, the reports had come in: The latest round of provincial elections in Iraq practically went off without a hitch. Indeed, from the United States' perspective, it couldn't have gone any better. Current Prime Minister Nouri Al-Maliki, America's preferred leader, saw his supporters -- primarily Shiite Arabs, and many women -- win elections across the country. Even better, secular Iraqis gained increased parliamentary strength -- at the expense of many smaller, religious candidates and parties. Given that the primary stated objectives of the Iraq War were to see the country emerge with a relatively stable central government -- and unlikely to take up arms against its Muslim neighbor-states, the elections were a victory. Of course Iraq won't ever be Walt Disney World, but Iraq is getting darn close to becoming suitable. And as far as the US is concerned, so many of the near-term dreams of the now-departed Bush administration are coming true. If the preliminary results stand (that's a major caveat: Think we have problems with exit polls?) Maliki's Iraq will have a strong, central government and, because the religious parties are seeing their parliamentary representation shrink, that central government will, by definition, be more secular. None of this, of course, would be possible had not Petraeus' surge approach proved successful. And, "surge" means both the actual addition of troops -- and the complementary tactical adjustments Petraeus added, such as co-opting various Sunni tribes. Those tribal connections have, apparently, held, with many of them participating in the elections. So, after Petraeus orchestrated his own version of a fourth-quarter comeback by pulling victory out of a likely defeat two years ago, will new "Coach" Obama completely change the game-plan -- despite the objections of his winning "quarterback"?